An article published in the journal “Astronomy & Astrophysics” describes the discovery of the star EBLM J0555-57Ab. 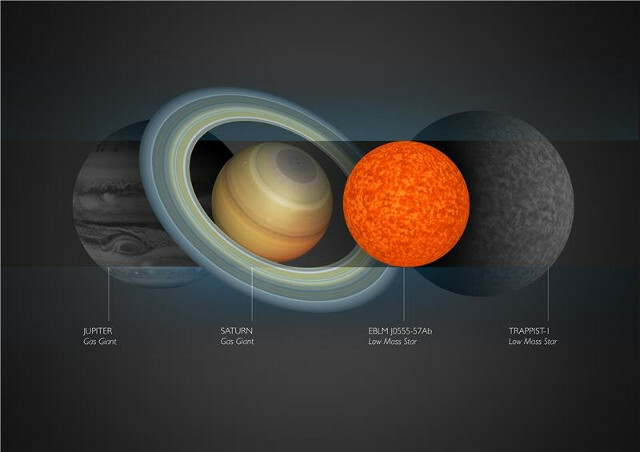 It’s the smallest star ever discovered, with a size very to the planet Saturn’s. Its mass is about 85 times Jupiter’s but, despite being concentrated in a relatively small volume, has barely enough mass and density to maintain nuclear fusion of hydrogen and thus be a true star. The star EBLM J0555-57Ab is about 600 light years away from Earth, in the neighborhood in astronomical terms. It was discovered only now because it’s so small that its light is extremely dim and is outshined by that of its companion EBLM J0555-57A, a star that in comparison is huge but actually is a little more massive than the Sun. Not accidentally, this tiny star was discovered during a search for exoplanets. The WASP (Wide Angle Search for Planets) project is an international consortium of academic organizations looking for exoplanets with the transit method, thus detecting the slight decrease in brightness that a star has when a planet passes in front of it. The surprise arrived when the observations of the EBLM J0555-57 system revealed that there wasn’t a planet orbiting the star but another star that’s really tiny. EBLM J0555-57Ab orbits its companion in about 8 Earth days and its mass, though limited, is more than enough to make a good estimate of it using the Doppler Spectroscopy method. In very simple terms, its mass and its resulting force of gravity cause changes in its companion’s position and velocity and these data help to understand better characteristics such as mass. The mass of EBLM J0555-57Ab is so limited that if it was even lower it could not support nuclear fusion and would have become a brown dwarf, basically a failed star. It’s no coincidence that these tiny stars are classified as ultra-cool dwarfs. The light of such a small star is so dim that it’s difficult to find one far away from Earth but even with more powerful instruments finding a smaller one will be almost impossible. To find exactly the boundaries between stars, one should discover brown dwarfs a little less massive than EBLM J0555-57Ab, another very difficult task since ultra-cool dwarfs are very bright compared to brown dwarfs. The researchers at the British University of Cambridge who discovered the star EBLM J0555-57Ab compared it to TRAPPIST-1, another ultra-cool dwarf. TRAPPIST-1 has been well-studied since planets have been discovered around it and even more after the announcement that in that system there are 7 rocky planets. TRAPPIST-1 has a size close to Jupiter and a mass close to EBLM J0555-57Ab but their situation is very different. TRAPPIST-1 is at the center of its own solar system, EBLM J0555-57Ab orbits another star. However, EBLM J0555-57Ab could have in turn planets orbiting it. In recent years, more and more studies have been focusing on very small stars in search for potentially habitable planets and this trend increased after the discoveries concerning the TRAPPIST-1 system. The study of EBLM J0555-57Ab is made more complex by the presence of a much larger companion but this may also make it more interesting for new research.